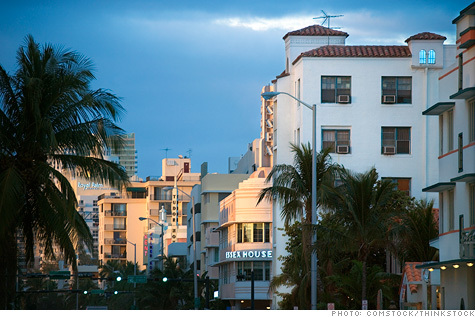 NEW YORK (CNNMoney.com) -- What the heck happened to the FHA's loans in Florida? The state dominates the list of troubled metro areas for Federal Housing Administration-insured mortgages. In fact, 16 of the top 25 locales with the highest default rates are in Florida, as of December, with tiny Punta Gorda on the Gulf Coast leading at 22.7%. The poor performance of Florida's FHA loans has helped drag the agency down to its lowest point in decades, raising concerns that taxpayers will have to bail it out. The agency is in the midst of overhauling its operations to shore up reserves, which have fallen well below the level required by Congress. Much of the blame lies in Florida's famous condo market, which collapsed during the housing bust. The controversial practice of seller-assisted downpayments is also contributing, as is the scarcity of jobs and the severe decline in home values. Florida homebuyers have long gravitated to FHA loans, which are aimed at first-time and low- to moderate-income purchasers. The state's relatively cheap home prices fueled the market for these government-backed mortgages. "The FHA got sucked into Florida because they loan in the price range where a lot of the vulnerability was," said Wayne Archer, executive director of the Kelley A. Bergstrom Center for Real Estate Studies at the University of Florida. FHA loans have been particularly popular among Florida's condo buyers. The agency has backed more of these mortgages in the Sunshine State than anywhere else in the country, insuring more than 11,000 loans valued at nearly $1.7 billion over the past five years. "Florida is ground zero for condos and for losses for condos," said Guy Cecela, publisher of Inside Mortgage Finance, a trade publication. "South Florida condos are the worst of the worst." Until the recent downturn, condos generally performed better than the housing market as a whole, agency officials said. Now, however, 28% of the FHA condo loans in Florida are seriously delinquent. In Broward County alone, four in 10 condo owners are behind in their payments. One reason was the condo building boom earlier in the past decade. Speculators joined homeowners in snapping up luxury apartments in new developments, driving prices sky-high. But when the market collapsed, these investors were among the first to bail out, dragging the entire development down with them. "We definitely see, from an FHA perspective, more entire or large portions of condos going into foreclosure than we do in other states," said Vicki Bott, a deputy assistant secretary at the agency. Another category of loans -- where the seller gives the buyer money for the downpayment -- has also blown up in the Sunshine State. Some 37% of these types of mortgages in Florida are delinquent, compared to 21% nationally. One reason why this loan segment has been hit so hard is because Florida's prices rose so quickly and then experienced steep declines, particularly along the coasts, Bott said. Florida ranks third in the nation, behind Hawaii and California, for home price appreciation between 2000 and September 2006, gaining 154.9% before hitting its peak, according to First American CoreLogic. Since then, it has fallen 45.7%, the third-worst performance in the nation, behind Nevada and Arizona. Many homes involved in seller-assisted downpayments had their values inflated, making their owners even more likely to default once the price collapsed, experts said. The state's weak economy is also contributing to FHA's Florida quagmire. At 11.9%, Florida has one of the highest unemployment rates in the country, and most of the big default cities, including Ocala, Fort Meyers, Sarasota and Fort Pierce-Port St. Lucie, have even higher levels of joblessness. Many borrowers with FHA-backed loans don't have the savings or resources to weather the Great Recession, said Elizabeth Boyle, managing attorney at St. Petersburg-based Gulf Coast Legal Services, which has seen more FHA borrowers walk through its doors in recent years. "The FHA loan failures we're seeing today are loans that failed because the real estate bubble burst," said Boyle, noting that the Florida economy is heavily dependent on construction. Borrowers "lost their jobs and are facing an extended period of unemployment." Darryl Gary is one of those unemployed delinquent borrowers. After losing his trucking job in October 2008, Gary struggled to keep up with the $1,400 monthly payment on his Sarasota home. Though he soon landed a post as a termite technician, it paid him $5.50 less an hour and only lasted for a year. Though his wife continues to work, the couple ran through their savings and then fell behind on their mortgage in the middle of 2009. He's trying to negotiate a loan modification with his servicer to help him get back on his financial feet, but he's finding that the job market is pretty weak right now. "If I hadn't lost my job, none of this would be happening," Gary said. "I was more than able to afford the mortgage. Once you fall behind, if you are making less than you were before, it makes it hard to catch up." FHA's skyrocketing default rates nationwide have forced the agency to change its guidelines. It has tightened its underwriting standards and, in January, unveiled a plan to increase premiums. Also, it will require borrowers to have a credit score of at least 580 to qualify for the agency's 3.5% downpayment program; those with lower scores will pay at least 10%. The agency has also taken steps to address the problems that are particularly plaguing the Florida market. It prohibited seller-assisted downpayments in 2008, after seeing they are three times more likely to go into default. Last year, the FHA overhauled the rules for condos, adding special restrictions for Florida transactions. Nationwide, at least half of a condo project's units now must be sold before the agency will back a loan, and no more than 30% of the units can have FHA-insured mortgages. There were no such limitations in the past. Also, the entire project must obtain FHA approval before it will insure a unit. Before, spot approvals were allowed. And in Florida, the agency is the only one allowed to bless a project. Elsewhere, lenders can do so in certain circumstances. "We want to know before we approve a condo project that it's a stable project that we'd want to lend in today," Bott said. Even with these new measures, however, the agency's default rates -- both in Florida and nationwide -- are likely to remain high for the next year or so, FHA officials and experts say. And the agency doesn't have much hope of recovering its losses in Florida because of the state's decimated property values. "There's a likelihood you'll see serious losses from defaults there," Cecela said.